“Head down this road until you come to street with a large metal sculpture on the corner,” she said with a comforting sense of certainty in her voice. “Don’t turn there but keep going about two more blocks and you’ll see it on the right,” she finished with a smile. I repeated the directions to her and began driving down the road looking for what turned out to be a three-foot bronze piece obscured by a newspaper box—truly a marker for where not to turn. We’ve all received or even given directions like this at one point or another: clear and simple directions based on what not to do. It got me wondering about all the other types of journeys we convolute in a similar fashion. How does one find their way physically, emotionally and even spiritually in a world where tangents are easier to follow than the road itself? I was headed home from the printer (Colorstep) after approving poster designs for Madcap Theater. The air was crisp with Fall and the sun was beginning another glorious dance across the late afternoon sky. I had the windows down just soaking up the last moments of the sunset with Miles Davis’ “Kind of Blue” playing in the background. Everything was perfect the day I banged up my car. To this day, I’m not sure what I hit but I will never forget my ability to slow time in order to memorize everything at the moment of impact: posters suspended above the passenger seat, the view out my windshield being nothing but sky and the look of fascination from the driver next to me at my car’s newfound ability to hover in mid-air. It was in this bubble of suspended time that I reviewed all of the alternate paths I could have taken to avoid the current situation. The moment ended when my car slammed back down to earth and dared me to wrestle control back from gravity’s whim. Much later, with my car repaired and my adrenaline normalized, I revisited events in the “time bubble” to further explore this introspective flash. The posters were still floating above the passenger seat as the sounds of bending metal played out in slow motion. Staring at myself in that moment, I saw more time spent worrying about the choices not made instead of focusing on the situation at hand. I began to wonder how often I’ve wasted valuable time and effort preparing for the unseen or focusing on things only tangentially related to the task at hand. 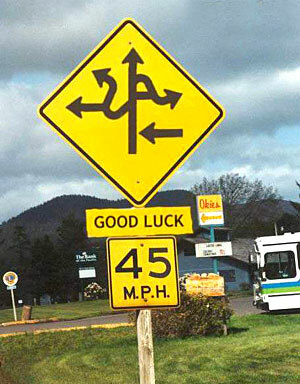 Perhaps I’ve asked the wrong people for directions or advice. Maybe I ask the right sources for guidance and only pay casual attention to the important details. Either way, I’ve often found myself so caught up in tracking a landmark that I fail to look ahead far enough to see where I’m actually trying to go. As I write this, my life is once again at a crossroads. Before me are several creative and career directions to choose from. My social life is healthy, my family life keeps me happily coming back for more and I want for nothing when it comes to entertaining diversions—perfect conditions for banging up the status quo. I’m ready to head down a different road but the directions I’ve written myself are becoming distracting. I’ve told myself to watch out for so many different things that my end goal is getting harder to see. I’m now running the risk of mistaking an intermediate ‘landmark’ for my final destination. Perhaps I need to spend less time looking for indications that I’m headed the right way and simply keep my eyes on the road.